Oops ... you weren't really looking for free shipping, were you? 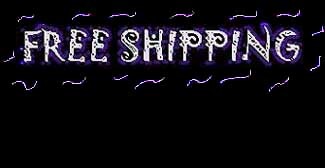 If so, read on to find out why free shipping offers are not always what they appear to be! "Get your free shipping right here!" Do you really think it's free? We did some research and found one of the search phrases used by people who are looking for live rock on the Internet is "free shipping". Folks, we've got a news flash for you. There ain&apos;t no free lunches. If what is important about your live rock choice is free shipping, you are starting off of the wrong foot and we don&apos;t expect that you will have the enjoyment and success with this hobby that you could or should. With gas prices what they are, do you really think someone is moving rocks across the country for free? Is the illusion of free shipping the deciding factor of what you want your live rock to be? The free shipping guys have some deals worked out and they pay a discounted shipping rate ... so, instead of simply passing that savings on to you, they market the discount as free shipping. Many of these places may also charge you a "processing & handling charge," or box charges, often around $25 per box or per order. In fact, what this fee may often pay is part of your shipping charges ... so, they really aren't "free" afterall. It all sounds real good ... and, in some cases, it can save people money on live rock, but what kind of quality are they actually getting with these deals? Sometimes shopping around for "deals" does not do you as much good as shopping for good quality. It&apos;s important to find out about the product itself, as you're going to live with the product for years to come and you'll long forget about the free shipping. Here we have you pay the airlines directly for your shipping. You pay them exactly what the charge is. We make nothing off of it. There are two ways to buy oats: before they've been through the horse, and after. The cheapest live rock is not ever the best live rock. "Good ain't cheap, and cheap ain't good." Be wise, aware and careful when you're out there on-line. Many of the people selling stuff are like the crooked wholesale suppliers that would deal in endangered Clarion Angels ... they will do and say anything to make a sale. For instance, we used to sell live rock and live sand from an island in the Fiji group called Namoli. Now I see on the Internet live rock being sold as "Australian Namoli live rock." What? Did the island migrate 3000 miles to Australia? Anyone who claims they have live rock from Australia is a bald-faced liar and you should not believe anything else they tell you! There is no live rock or corals that are exported from Australia! It's a great tip-off to know whether or not someone is being honest with you. You can't even take a molted bird feather, picked up off the ground and take it out of Australia! On another website, I saw a picture of a dead looking piece of rock. It had stuck into it an Elegance coral, a nice huge Sarcophyton Leather, a Euphyllia (Torch) coral, and a few other things. The caption said that this was their rock "a few weeks after curing." And though they couldn&apos;t guaranty what would grow out of yours, this was "the type of growth you could expect." This type of misleading dishonesty is rampant on the Net. They make themselves look cheap and unfortunately much of the buying public thinks the best price is more important than the quality of the product they are investing in. We would rather explain our price once, than have to apologize for our quality forever. The substandard products some of these folks send out doesn't do the job, and loses hobbyists who are spending their hard-earned cash trying to do something interesting. Few can see it was not really good live rock to begin with as it is always hard to admit our own mistakes. So let&apos;s be careful out there folks. Don&apos;t believe everything you see or read. And always ask yourself if and when the cheapest anything is the best, and if that shipping is really free.